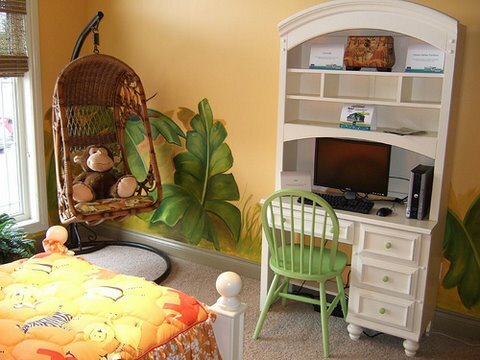 Are you looking for kid’s room painting ideas? Great! You are in a right place! If you and your child have decided to redecorate their bedroom, you will be pleased to know that there are many different kid’s room painting ideas that you can choose from. Before you start buying paint for your child’s room, think about a few important things. How old is he/she? What kind of budget are you working with? Will you have to upgrade to a more sophisticated look in just a couple of years? Is he antsy or lay back by nature? What are his favorite colors and activities? When you have answered all these questions, you will be ready to start painting your kid’s room! Here are some room painting ideas to get you started. 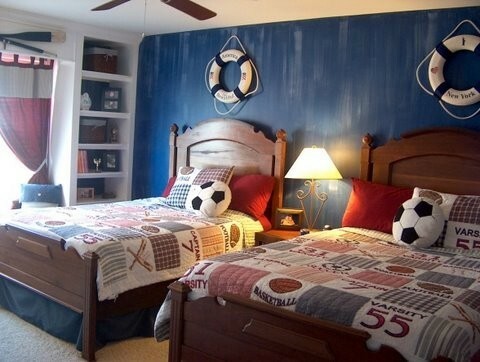 When you are choosing paint for kid’s rooms, you have to remember that it has to be wash well and scratch resistant. The best choices for durability are satin, egg shell and semi-gloss paints. Chalkboard paint - great to use on one of the walls. Kids can write on the wall with chalk and then wipe it off. Glow in the dark paint - the latest craze among older children and teenagers. You can create pictures of our solar system, dinosaurs, favorite characters, and more by using glow in the dark paint! Magnetic paint - great to use on one wall or just part of the wall. It is fun way to hang up posters, kid’s artwork or memos. 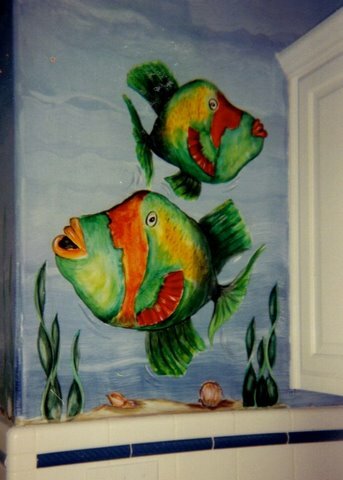 Glitter paint - fun non traditional way to make your kids walls shine. Try for princess room theme and winter room theme. Be aware that warm colors (reds, oranges, bright yellows) are a good choice for rooms that are dark, cold, and that don’t get much sun. If the room is sunny, warm, and bright all the time, it is wiser to use the blues, grays and greens that suggest a cooler feel. When considering bedroom painting ideas, you should consider unique designs that can be used on the walls of the room. 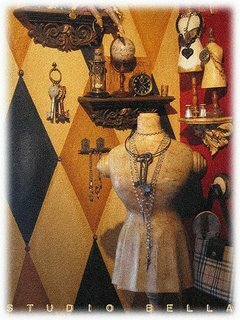 These designs could include an assortment of stripes, checkerboard designs, different colored polka dots and even incorporating a large assortment of different sized diamonds on the walls. If you really want to get creative with unique designs, you may decide to place the same types of designs that you utilize on the walls of the room on the furniture that is located in the room as well! Many children, especially elementary age children, may enjoy integrating poetry and lettering into their room. You can purchase letter stencils and number stencils in order to place poems and/or nursery rhymes on a wall. You may even elect to incorporate a poem that your child has written in order to create a high level of customization into the room! When deciding on room painting ideas for a child, you may find that electing to go with a theme that incorporates their favorite cartoon characters, heroes, or even their favorite villains is the way to go! You can easily paint an underwater bedroom scene for the Sponge Bob fan, or a galaxy of unique aliens for the Ben 10 fan! If you have a daughter that you are working with, painting the Care Bears or even Barbie on the walls may be the way to go! 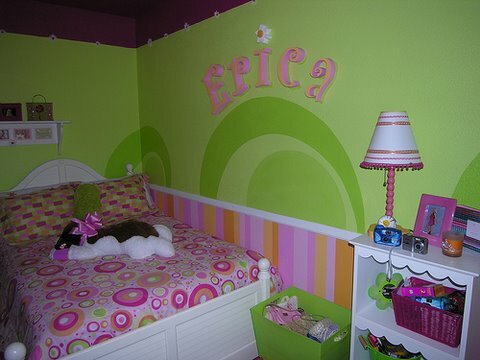 If you have elected to go with one basic color, you may choose to integrate an art wall in the room of your child. Basically, this involves incorporating large sections of drawing paper and hanging it on a wall in the room. You and your child, your child, or your child and their friends may color, draw, and paint on the paper. When your child is tired of one scene, you can remove the paper and place a new sheet up and create a whole new scene. Last, but not least, when considering bedroom painting ideas and colors to paint a room, you may elect to go with a faux finish. 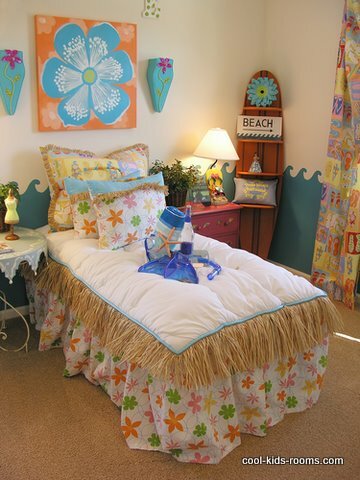 This a perfect choice for parents that are electing to incorporate fun and creative finish for kids rooms. Faux finishes can easy camouflage and hide fingerprints and dirt. Last, but not least, when you and your child have debated room painting ideas and simply cannot agree on just one, perhaps you could create different artwork on different walls. If all else fails, allow your child to have a paint brush and an assortment of paints and allow them to create a “splash” effect of various colors! These ideas are perfect for the “undecided artist” and the parent that is all out of room painting ideas! When painting a child's room, never forget... this is all about him, not you!